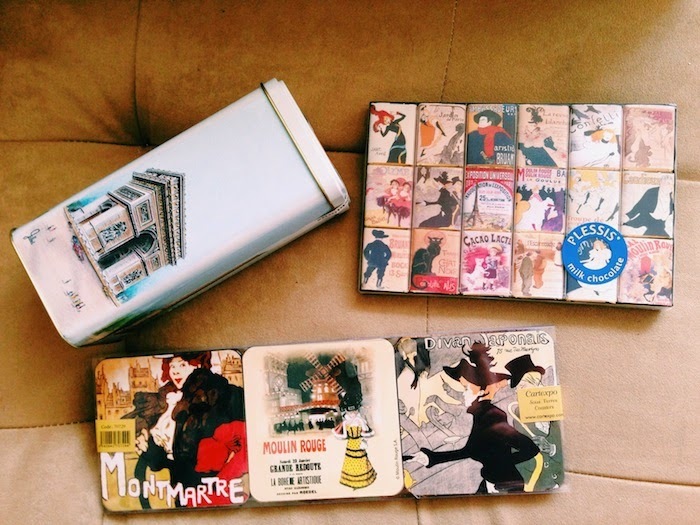 I'm not usually one to purchase "touristy" gifts, I'm really much more of a "I'm gonna bring you some cheese and chocolates from Europe" kinda gal. But the last time I was in Paris, I was busy rushing through my weekend, mainly focused on a boy, that I completely forgot to really take some time to find quirky little things around town to take home with me. So, as requested by a readers, here is the loot I went home this time around. 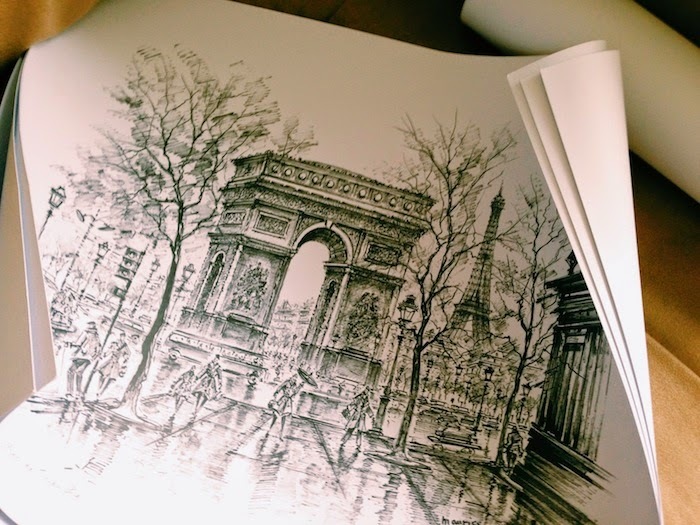 On a beautiful sunny day in Montmartre, I picked up a few prints of pencil drawings of the famous sites of Paris. They were a steal at 6 Euros for 4, so I stocked up - now all I need are frames. 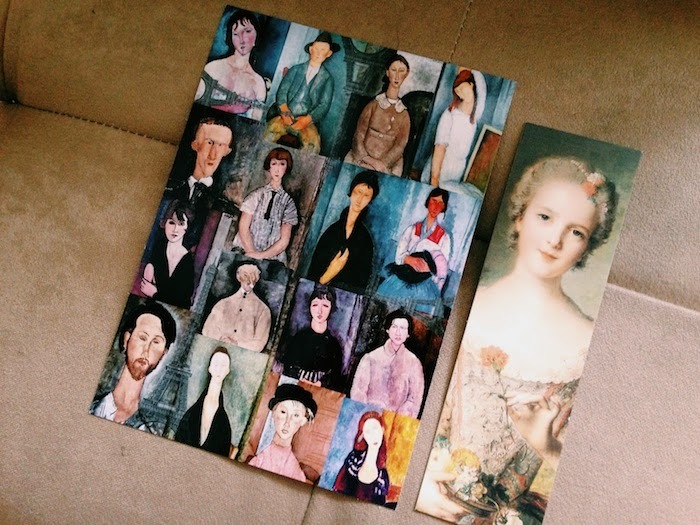 Stopping at every single souvenir shop on the Champs Elysees, digging for pretty post cards, I found one made of a collage of Amadeo Modigliani (1884 - 1920) portraits, and a bookmark of a Jean-Marc Nattier (1685 - 1766) painting of Louise-Marie de France, painted in 1748. Approaching a new creative job, I figured it would be of absolute essence for me to kick off my role, surrounded by inspirational items. 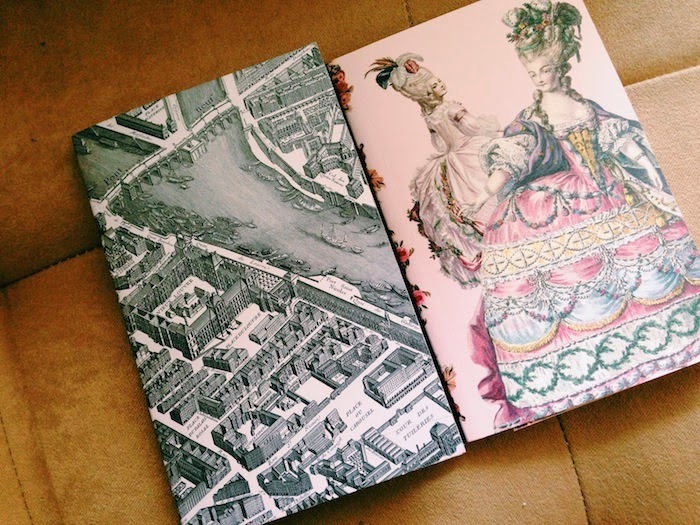 I got these two notebooks, the one on the left is mine, which I got at a book store near the Louvre, of a map of Paris from 1734 - 1739 and the one on the right I got for my twinso Erica at Chateau de Versailles, with pretty artwork of Marie-Antoinette. 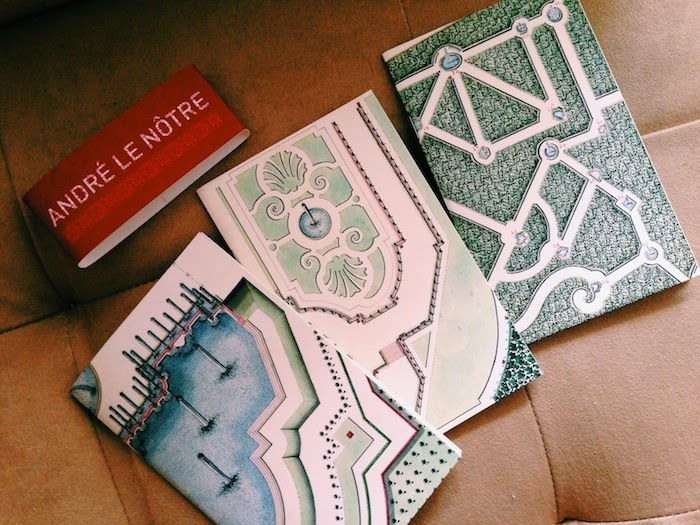 One of my favorite purchases was a set of notebooks (showing how much of a geek I am) bound by plans of the gardens of the Castle of Versailles, as designed by renowned landscape architect Andre Le Notre in 1661. 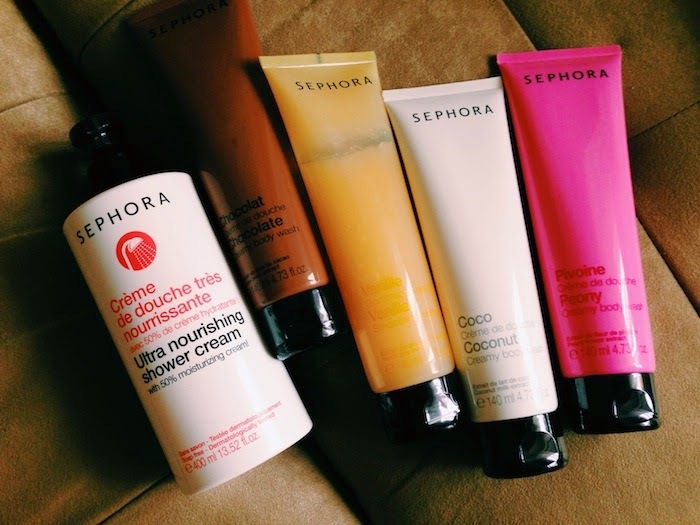 During a quick stop at the massive Sephora on the Champs Elysees, I picked up a few cream body washes after being prompted by Erica, who was frustrated about not being able to buy her favorite chocolate flavored version.. she likes to smell like a cup of hot chocolate. I picked up a few of the Sephora shower creams, because I suffer from really dry skin, and this one is 50% moisturizing cream - a winner in my book. 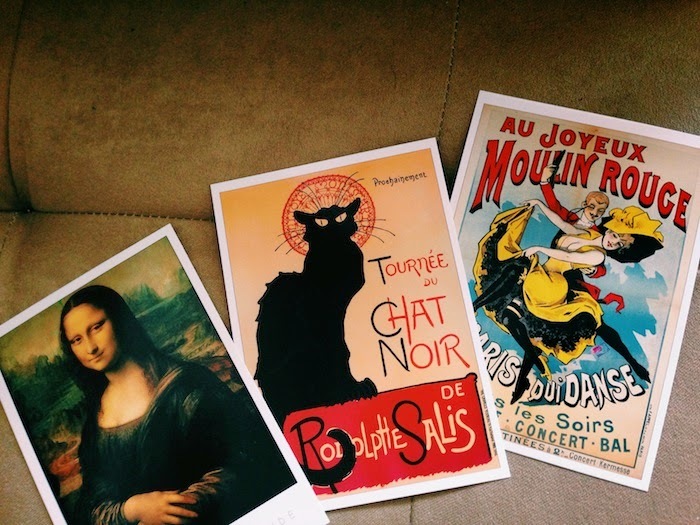 I did ambition to send out some post cards (which never happened TBH) so I picked up more post cards at a souvenir shop on the Champs Elysees - of course Mona Lisa had to come with me! Lastly, on the way out of France, at the airport, I got rid of my few remaining Euros by buying a box of cookies for Ornusa, some coasters for Carla and chocolates.. for me of course.